There’s been some ‘entente cordiale’ playing out at the start of the TJV with one of the oldest boats in the race, the British designed and built Class 40 Matouba, sailed by two French sailors trading places at the top end of this highly competitive fleet. 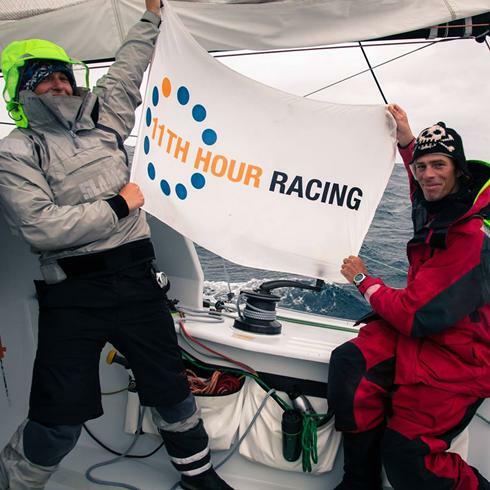 The Pro-Am French pairing of Sébastien Audigane and Bertrand Guillonneau have been working hard and are definitely on the pace in the first thirty six hours of the TJV on their four year old Owen Clarke custom designed Matouba. 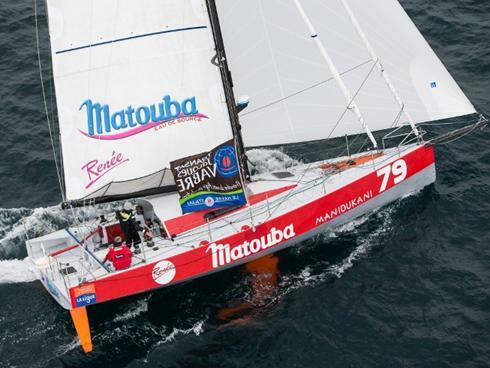 Having been poled in first place in the first few hours of the race they headed into the night half a mile behind the leader and a quarter of a mile ahead of the new Botin 40, Tales Santander. By the middle of the next afternoon Seb and Bertrand had finished the impromptu first leg of the race only thirty minutes behind third placed MARE, as the lead pack were bunched close together at the finish. They'll be pleased with that. Meanwhile Hannah Jenner and Rob Windsor on 11th Hour Racing after a good start report hitting a few windless holes and were unfortunate to be languishing at the back of the fleet, but in good company with a number of the other fancied Class 40s and two IMOCA 60s. 11th Hour Racing, so many times the bride (3rd in the last TJV for an example) while her sister-ship missed the podium with three fourth places in major races the previous two years, was this time the bridesmaid. 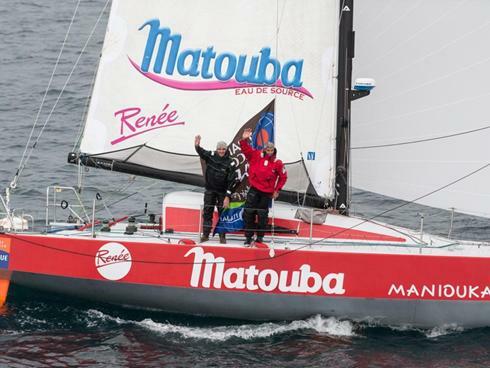 Hannah and Rob finished a little under two hours after Matouba crossed the finish line of the impromptu stopover in Roscoff. Hannah commenting on the dock: " We would have preferred to be with the front runners but the wind hole at the start blew that one. Still we made up over 8 miles on Croix de Sud sailing past them this afternoon and we were ahead of an Open 60 which was not expected. Today was a good measure of what we can expect when we are finally released into the Bay of Biscay. 35 knots of wind, big seas and a very wet ride......Over a race this long it's still very close and who knows what will unfold in the coming weeks. We are the hunters now, we have our game faces on and we are ready to catch our prey". The fleet will depart from the Northern Brittany port of Roscoff in chronological order starting at the earliest, 22.00 hours on Saturday evening having taken shelter briefly from a storm front passing through the Western Approaches tomorrow. Cutlass (ex 11th Hour Racing in the 2011 TJV) the 2008 Class 40 champion, later winner of the Bermuda 1-2 and the first Atlantic Cup was sold this week through the OCD brokerage to a new US based owner. The boat’s presently ashore in Charleston and while her program for next year isn’t carved in stone, this means the most successful so far of the nineteen class 40’s in North America will be back racing next year after two seasons ashore. Good news, especially for the US east coast Class 40 fleet. OCD’s brokerage arm has seen a marked resurgence of interest in the Class in North America in the last three months and we’re expecting to have sold both of the remaining US based boats on our brokerage in time for next season.